1st Quarter: (N) Norwood 84-yard punt return, XP good; (S) Jeremy Ruskin 19-yard pass to Chris Gong, Mitchell Director XP good; (N) Norwood 12-yard pass, XP good; (S) C. Gong 99-yard kickoff return, M. Director XP good. 2nd Quarter: (S) Drew Naisuler 4-yard rush, M. Director XP good; (S) D. Naisuler 2-yard rush, M. Director XP good. 4th Quarter: (S) Jake Romanow 16-yard rush, XP no good; (N) Norwood 84-yard pass, 2-point good. Attleboro, 1 @ North Attleboro, 2 – Final – For the fourth straight year, the Rocketeers won the Leach and Garner Cup against rival Attleboro. North senior Gabe Pinhancos scored a pair of goals, first opening the scoring midway through the first half on a breakaway after being sent in behind the defense on a flick from sophomore Dylan Corrigan. Pinhancos made it 2-0 in the 65th minute, converting a corner kick from Ryan Pasquel. Attleboro junior Will Halben cut the deficit to one with a goal in the final five minutes. Pinhancos and Attleboro’s David Medeiros earned MVP honors for their respective sides while NAHS coach Geoff Burgess praised the defensive work of Kevin Aguilar and Zach Matracia. Burgess also noted that Pasquel had his best game of the season patrolling the midfield for Big Red. Attleboro, 0 @ North Attleboro, 3 – Final – North clinched the Blue-Red Cup behind a goal and an assist from Haley Guertin and a school record ninth clean sheet of the season. Guertin opened the scoring on an assist by Leah Jette before Rachel Labonte scored on a 20-yard free kick to make it 2-0 at the half. Guertin assisted on Emma Gaulin’s second half goal to wrap up the scoring. North coach Bill Wallace said that Felicity Monfils, Aine Mendonca, Emily Chiasson and Lauren Dowd played well in the midfield. Labonte and Attleboro defender Morgan Laplume were named the players of the game. 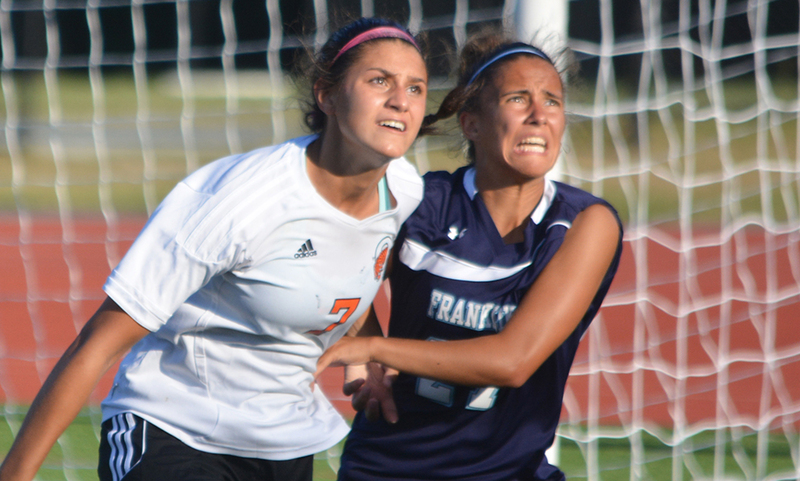 Oliver Ames, 0 @ Mansfield, 1 – Final – Sydney Mulkern scored the only goal of the game on a cross from Cassidy McMahon. Sophia Cox had a free kick go off the bar and a goal ruled out on a corner for the Tigers. With the win, the Hornets clinched a share of the Kelley-Rex division title for the second year in a row. Click here for a Photo Gallery from this game. Attleboro, 1 @ Taunton, 2 – Final – Taunton built a 2-0 lead with a goal in each half to conclude the regular season with a win over visiting Attleboro. Senior Liana Duarte put the Tigers up 1-0 in the first half and freshman Alana Tavares made it 2-0 in the second half. THS junior goalie Emma Sheehan made eight saves while Kathryn Robinson and Jillian Pagliuca had strong games defensively for the Tigers. Hockomock League Championship – Click here for the complete list of Results and Photo Galleries from the meet. STOUGHTON, Mass. 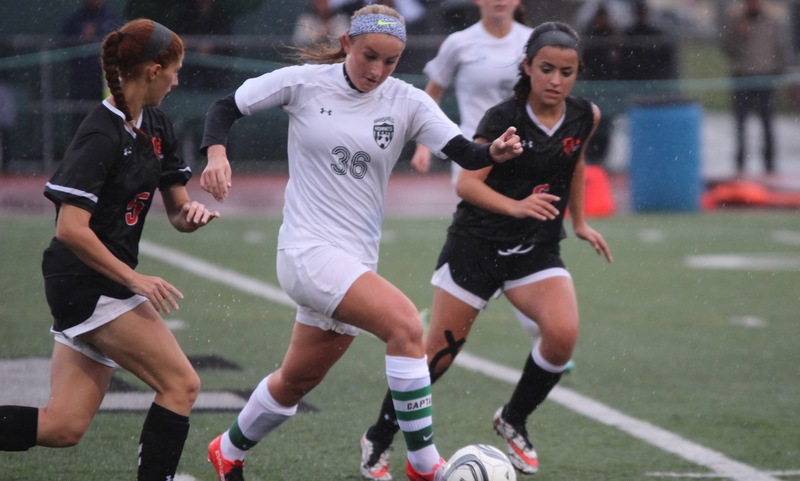 – Attleboro used a slight adjustment in its formation and renewed energy in the second half to earn a 2-1 comeback win on the road at Stoughton. The Knights came out with high energy, which resulted in a majority of the possession and play in their attacking third. It also resulted in a lead for Stoughton just over the midway point. But Attleboro head coach Steve Santos tinkered with his five-member midfield at the break, pushing certain pieces forward to close down the space Stoughton was working with. That change, along with a renewed energy and a pair of fortunate bounces helped the Bombardiers earn two points. “Stoughton played really well in the first half, they wanted it and they came out with a lot more energy than we did,” Santos said. “They got the reward for working hard and we kind of put our heads down. We had a talk at half and the energy came in the second half, we had a little bit more intensity. The girls just worked for it, and we got the bounce in the end. Attleboro had a pair of chances inside the first 20 minutes of the game, with senior Alison Wall tracking down a through ball and firing a shot from atop the area, but Stoughton keeper Emma Harrington was there for the save. Just five minutes later, sophomore Sophia Salviatiplayed a through ball for freshman Briley Harnois, but her bid at the far post just slid wide. Stoughton continued its pressure and began to register chances. Junior Elizabeth Kashian put the first shot on frame with a low big from the top of the area, but Attleboro keeper Madison Brown scooped up the shot. But two minutes later, the Black Knights were able to break through. Mackenzie Manning delivered a cross that was flicked on by Sarah Widrow behind the defense. Stoughton sophomore Chinazo Odunza raced in and was able to slide her shot in to make it 1-0 in the 27th minute. Stoughton had a chance to add to its lead in the 37th minute when a corner kick dropped just a yard off the goal line, but a scrum ensued and Attleboro was able to clear it. Harrington took away a chance from Attleboro’s Isabella Salviati on the other end by charging off the line. The shift paid dividends right away as the Bombardiers put the pressure on early on in the second half. After a ball was cleared, Attleboro put a long ball back into the box that accidentally hit a Stoughton’s players raised hand, giving the Bombardiers a penalty kick. Harnois stepped up and placed her shot into the bottom left corner to bring the Bombardiers level. Attleboro kept the pressure up throughout the second half. Julia Hayes had a shot from distance turned away by Harrington off a bounce. Five minutes later, Morgan LaPlume played a perfect ball through Stoughton’s back line for Ashley Lauzier, but Harrington came charging off her line and made a great sliding save. Shortly after Harrington came out for the sliding save, the Knights went on the counter attack. A touch from Manning put her in along with Odunze, but Attleboro defender Jordyn Foote thwarted the attack. In the final minutes, the Bombardiers got their reward for continual pressure. Harnois whipped in a cross in the 78th minute that took a deflection off a Stoughton defender and found the back of the net to make it 2-1. 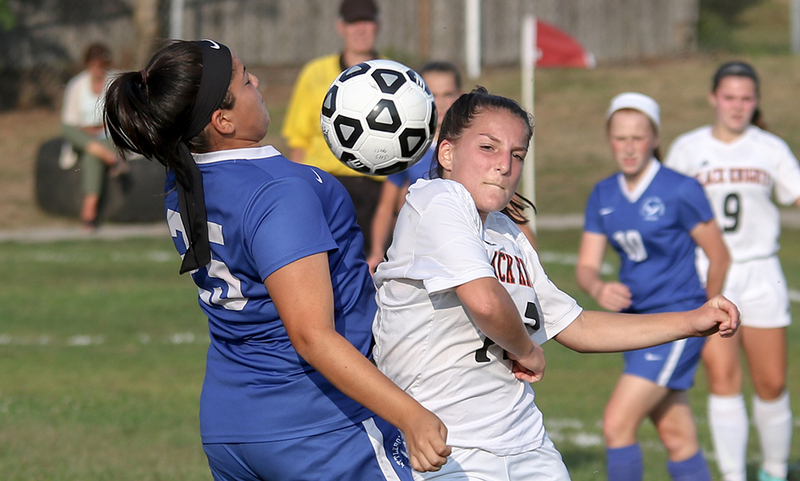 Attleboro girls soccer (1-1 Hockomock, 1-1 overall) returns to action on Wednesday when it hosts Sharon. Stoughton (0-2, 0-2) travels to Mansfield on the same day to take on the Hornets.